In the past we've debated the pros and cons of 'wind' versus 'mag' versus 'fluid' style trainers, and the relative merits of their support structure. With the advent of the smart trainer, indoor training has been revolutionised and all of these trainer styles are old news. Michael Hanslip shares his thoughts on buying a new device and reviews a selection of the new internet enabled trainers. Almost all the big names in home trainers now makes at least one model that will allow you to engage in virtual training. Many brands have their own proprietary (or open) virtual training platform and there are numerous independent options as well. 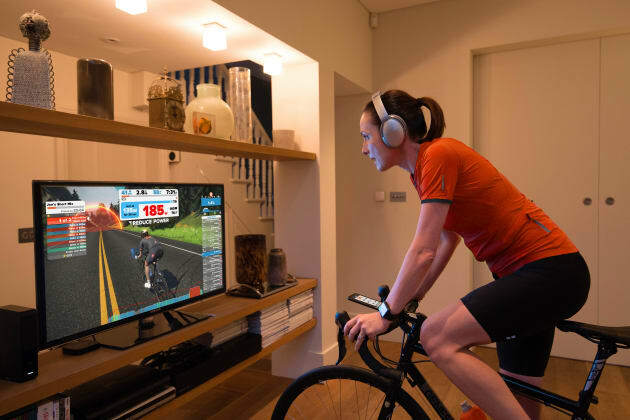 Everyone I know, however, who trains indoors now unites around a single platform – Zwift – and the smart trainer is simply a means to this virtual reality end (see Box One). I had never Zwifted before this review. I do, however, enjoy the use of a smart trainer. I use one in 'erg' mode, which is a power-controlled mode. No matter how fast or slow one pedals, the resistance of the unit is adjusted to provide the prescribed power output. This brings the opposite-to-outdoors feeling that the faster you pedal, the easier it gets (power = force x cadence). Trainers, smart or otherwise, are of two basic types; wheel on and wheel off. There are advantages to each type. Leaving your wheel on is simple, but it is only as secure as the connection between the rear wheel skewer and the trainer frame (virtually all include their own skewer to ensure a solid interface). The tyre to roller drive is subject to slippage and, for some trainers, extreme tyre wear. Taking the wheel off means no issues with tyre slippage or wear, but then you either require a second cassette installed on the trainer or to swap the one off your bike with each use. My personal baseline for trainers are the two I have. 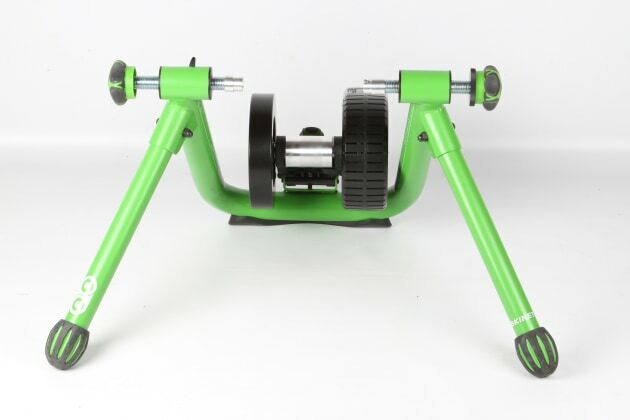 The Kurt Road Machine is a fluid resistance 'dumb' trainer that sets the standard for me for stability and ease of use in the wheel-on trainer realm. The Wahoo Kickr (gen 1) is the only smart trainer I had used prior to undertaking this review. Being very happy with the Kickr, each of the review trainers will have to compare to my Wahoo. I also borrowed a friend’s Tacx Neo because it is unique amongst smart trainers in not having a belt – the bike chain drives the actual resistance mechanism directly (and that belt makes noise on all the other direct drive options). The Neo is able to function as a motor for downhill and tailwind situations – virtual reality seems awfully real when the rear wheel speeds up without rider input. 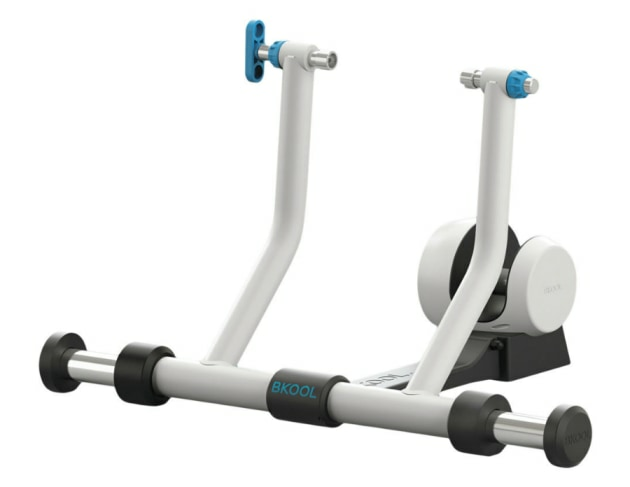 For this article I gathered together a variety of smart trainers across the price spectrum: Bkool Go! and Kurt Road Machine Smart are the entry-level options in this group being the only wheel-on trainers of the group and the only ones under the one thousand dollar mark. At the opposite end of the spectrum lies the TechnoGym MyCycling. With a retail prices set well above $2000, this is a serious investment in your indoor riding future. In between sit the Elite Direto, Tacx Flux, Jet Black Whisperdrive Smart, Wahoo Kickr gen 3 and CycleOps Hammer. Garmin is one of the big names in GPS, and therefore in GPS cycling computers. Garmin created the ANT+ standard (see thisisant.com) which links power meters, computers, speed and cadence senders and even Shimano’s Di2 through a common communication interface. With the introduction of the FEC protocol (Fitness Equipment Control) any ANT-FEC compliant head unit can control any compliant smart trainer. The alternative protocol is Bluetooth (specifically Bluetooth Low Energy – BLE). An advantage of Bluetooth is that most phones and computers are equipped with this out of the box. A small disadvantage is that it is a 1:1 pairing (which can be a problem for more 'customised' installations and if you run Zwift via your Apple TV it has a 3 device limit). Most of the smart trainers are both BLE and ANT+ ready. The Bkool can only use one or the other, not both simultaneously. The TechnoGym and Kurt do not use ANT+FEC at all. The rest are able to connect via ANT+ and Bluetooth simultaneously (for example, via Bluetooth to an Apple TV running Zwift and via ANT+ to a Garmin device recording the ride – and, yes, I realise Zwift records the ride as well but sometimes you just want multiple connections). Based on my discussions with smart trainer users, I am really showing my coaching slant and flying solo in caring about the erg mode. Erg is short for ergometer – literally a device that measures work done by a person, but rowers call their trainers 'ergs' and the terminology applies to instrumented indoor cycles too. A controlling device (handlebar or wrist mounted cycling computer or a phone or personal computer via an app) tells the trainer the resistance required in Watts and the trainer does its best to provide this resistance regardless of the cadence and gear chosen by the rider. My Kickr is particularly good at this so I was quite disappointed as I worked through the review units to discover, one by one, that none of them had the same 'grip' on the power. This is more of a problem for a pedantic coach (me) than it is for how the workout proceeds. Which is to say that each trainer provides a proper workout used this way. Anyone who has ridden on the road with a power meter will know that the power is seldom constant. It moves – always. Small variations in the road surface, the slope, the wind and the rider’s effort all add up to power figures that bounce around. Why should it be any different in the VR world? 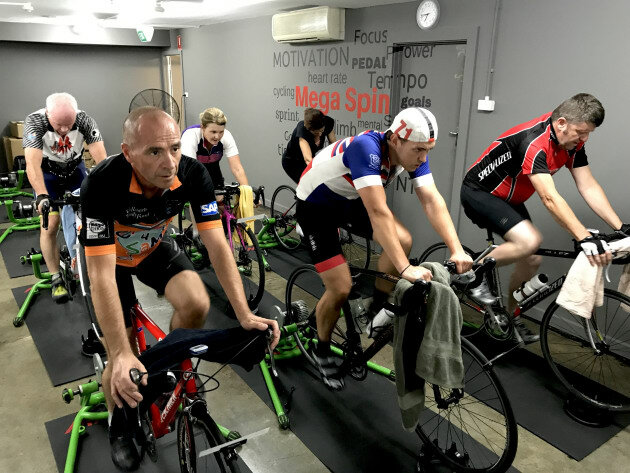 When hooked to Zwift and ridden like a bike rather than like a lab instrument the pedalling efforts felt pretty much exactly as expected across all of the trainers. The power accuracy of the smart trainers varies roughly in line with the price. Accuracy is important for two reasons if you are going to the trouble to buy a smart unit. First, you want every instance of a specific power to be the same as every other instance of that power (which is technically precision rather than accuracy). And second, especially if you use an environment like Zwift, you want your power to be the same as every other user you are riding with (imagine if your trainer was 20% high compared to actual – you’d be worn out quickly just keeping up!). The wheel-on trainers complicate both precision and accuracy by the tyre/roller interface. The amount of pressure on the roller impacts on the amount of slip that occurs which in turn affects the power measurement. 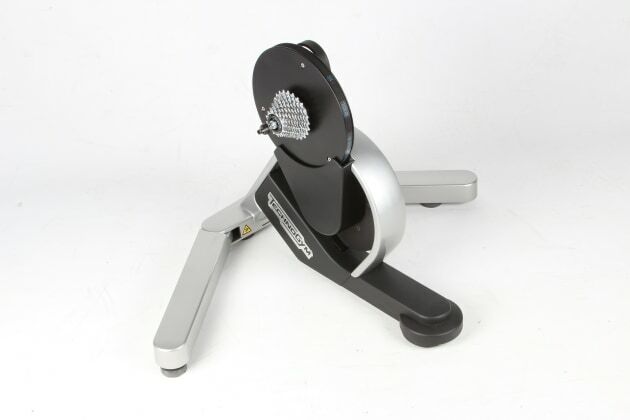 It is important to calibrate a wheel-on trainer each time you use the trainer. In contrast, some of the direct drive trainers don’t even have a calibrate function. Virtually all of the trainer manufacturers have an app that can assist you to get fitter. The ones from Elite and Tacx have history extending back more than 10 years (when the video was actual video and the frame rate was changed to match your speed). All of them offer some customised training aspect that may, or may not, be included free with the purchase of your trainer from that company. I didn’t explore any of these. I feel like I have barely scratched the surface of Zwift in the review period – it would take months to work through all of the manufacturer-specific apps as well. If you are trying to decide between trainers for yourself, perhaps investigating their apps will help you to decide. I debated providing a sound level rating for each trainer. Noise is a concern for many indoor cyclists. Whether it is waking the children during a late night session or annoying the downstairs neighbours if you live in a unit, noise is important. I even got my decibel meter out and had a go at measuring the noise. Both long term using various trainers in the past and over the last month with these smart trainers – suggests that there is far more to the irritation factor than the dB rating of the trainer. For example, my rollers are very quiet but they create a vibration in the floor that annoys downstairs neighbours even in a concrete high-rise. Some of these smart trainers are very quiet, but have an annoying (to me) whine. Others are loud but relatively unobtrusive. If noise is your issue, then the Tacx Neo is your trainer – it is so much quieter than anything else I’ve ever tried there is no contest. The only noise I could hear was my worn chain and cassette remonstrating me for not replacing them yet. The direct drive trainers require a cassette to work with your bike. The Wahoo and the TechnoGym come with an 11-speed cassette installed already. The beauty of 11 speed is that any cassette should work fine with any drivetrain (SRAM, Shimano or Campagnolo). If you are not using 11 speed (like me!) then you’ll have to supply your own cassette regardless of trainer. Except for the Tacx trainers using the Edco freehub body (fits SRAM/Shimano and 4-spline Campagnolo cassettes) the standard is for a SRAM/Shimano freehub. Many trainers offer both Campagnolo and XD-driver (SRAM MTB) freehub options, so if that’s what you want you’ll have to ensure it’s available and budget accordingly. I was honestly surprised to discover that while these trainers varied wildly in their behaviour in erg mode, they were all very similar in their virtual ride behaviour. When the terrain on your screen points up a hill, or the speed increases, the load on the pedals gets appropriately more difficult. With sound and graphics – almost as much is going on as on a real ride – it is easy to overlook a trainer that is a bit slower (or faster) than you expect to ramp up the load. This is the least expensive trainer in the test, and it shows. The support frame is adequate, but it lacks both the solidity and stability of better wheel-on trainers I have used. The stability feet are quite clever – they pull out from the main base of the unit – but probably not quite far enough to make it rock solid for sprint efforts. A really cool trait is that it automatically adjusts for different wheel sizes; the hinge between the base and the bike support sides of the Go allow almost any wheel size to rest directly on the resistance roller. That also means that one never needs to adjust the pressure of the roller on the tyre – the rider’s weight does that. Unfortunately, with a rough sprinting style the tyre can slip on the roller. In theory the Go works over both ANT+ and BLE communication channels, but only one at a time. Despite extensive help from the BKOOL team I never successfully swapped the default BLE to ANT+. Further complicating matters is the fact that the BLE protocol BKOOL uses is proprietary. I couldn’t use the Go on Zwift because BKOOL hasn’t shared their BLE information with the Zwift team and I couldn’t use the Go with my Garmin because that uses ANT+. As a last resort I signed up for the BKOOL virtual cycling portal (similar idea to Zwift) and took a few rides in their virtual space. It behaved exactly as expected with a realistic variation in pedalling resistance to match the terrain and speed. The only direct drive trainer that does not fold up. While this is fine in use, it makes carting it through doors a little more difficult. The Flux looks like a quality unit that sends cadence through its ANT+ and BLE links. This was a frustrating favourite. Frustrating because it does not fold up or have a handle, making moving it really difficult. A favourite because it functions so well as a trainer. Removing the Flux from its box, assembly takes all of 30 seconds; insert the leg piece and install two bolts. The legs have a wide stance that makes it very stable in use (but being wider than the doorways in my house made carting it to the back deck for use hard – I had 10 trainers scattered around my living room during this review and I moved one each time to the deck to actually ride). This trainer is quiet. Almost as quiet as the Neo I tried and with noticeably less whine than my personal Kickr. Response time to power changes is quick and smooth. 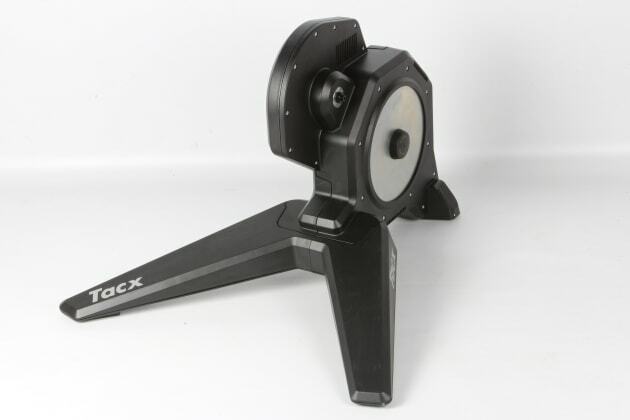 The Tacx wireless link provides power, speed and cadence so the rider knows exactly what they are up to at all times. The Edco freehub body on the Flux is unique in that it will take all Shimano/SRAM cassettes as well as four-spline Campagnolo cassettes. Very handy if you happen to use Campagnolo gear. Just be careful when installing a Shimano/SRAM cassette as it is possible to install individual sprockets back-to-front when not paying attention (this is impossible on a regular freehub body). I liked the fact that the Flux uses a standard power cord to connect to mains power. All the other trainers have a transformer box – Tacx must have put the transformer inside the trainer. Three lights indicate power and ANT+ or BLE connections. Great for the permanent pain cave! 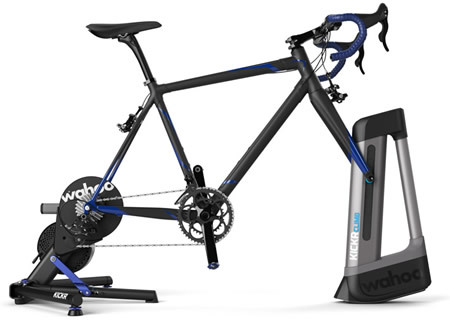 Wahoo was the first to market with a current generation open-platform wireless trainer such as these I am reviewing here (Tacx and Elite have been doing their own “responsive” trainers in a closed system for decades) and, now in its third generation, it shows. Improvements from my gen 1 Kickr to the review gen 3 Kickr include a better carry handle, a lower profile shape to play nicely with disc brakes, lights to show ANT+ and BLE connectivity, revised firmware controlling different internal hardware and – the one I am still eager to try – compatibility with the Kickr Climb unit that tilts a bike to correspond with the slope being ridden in the virtual space (or responding to input from the bar mounted controller when in erg mode). The new Kickr is also slightly quieter than my older one (which means it is about average in this group). All Kickrs have two independent fold-out legs with adjustable feet that lock in carry position as well as riding position. It is very stable. I never felt like I was going to upset the bike even deliberately bouncing around on a ride. The new Kickr comes with the pieces required to suit the greatest range of rear axle sizes of any trainer reviewed (see the table). This is the only trainer that is height adjustable, meaning almost every bike will sit level with a simple change to the trainer. There is a cadence sensor in the box with the Kickr, meaning that it doesn’t measure or compute rider cadence internally. This is fine for most situations (all current Wahoo gear works on ANT+ and BLE by the way) but it is one extra BLE connection which is a problem for connection-limited devices like the Apple TV. In erg mode the Kickr is still the best at locking onto set power and holding it stable. This is another very good trainer. It feels much lighter than all the other trainers on review even though it is not that much lighter than some. I attribute this to the great built-in handle and balanced weight distribution. It is quite light despite being much larger than the other trainers. That size is really only an issue for storage as there is little variation across the trainers once a bike is on top of them. There are three legs on the Direto. The central one is fixed in place while the outer two pivot 90 degrees between carry and ride modes. The legs lock into ride position but do not lock in carry position – and they do flop around a little bit, spoiling the carry-ability of the unit slightly. Once locked out they provide excellent stability. The legs are widely spaced and in the correct location to hold the bike up. The Direto has three lights on it indicating power, ANT+ and BLE connections. The response time of the Elite is swift. It uses a unique optical power meter (the design is shared with the more expensive Elite Drivo not reviewed here) with good accuracy that also provides the cadence, so no cadence meter is required. Typically a lot of the mass in a trainer is located in the flywheel. A heavier flywheel carries more momentum so that heavier often equates to better “road feel”. The Direto feels fine even with its light overall weight. This trainer is quieter than average and that noise was not a bad noise either. Before I took the Kinetic out of the box for the first time, I knew what to expect as far as the trainer frame went as it is virtually identical to the Road Machine I have at home. Which is to say, really good! Solidly built, stable in use, easy to fold and not too bad to carry around (the resistance unit does flop a bit). The Kinetic trainers are the best wheel-on devices I have tried (and I have used more than a few). The review unit has soft-touch knobs which are an improvement over the hard plastic ones on my own trainer. The tyre runs on an oversized roller that makes slippage less likely and reduces tyre wear markedly. I can also vouch for the excellent manufacturer backing of this product. After six years of regular use one of the threaded parts that hold the bike in was worn. Only four days after contacting the US head office, I received a free replacement from the Aussie importer. Adding smarts to an already good trainer makes for a good smart trainer. The response to power changes was quick and accurate. I was disappointed with the lack of ANT+ connectivity, but the BLE side worked fine. Direct drive machines have quite a lot of belt noise, the Kinetic has tyre-on-roller noise – meaning it has about the same level and type of noise as the other trainers. There is a power light, but no connection indicator. I got a chance to speak on the phone with one of the JetBlack engineers who developed this trainer. He really wanted to ensure I used the newest firmware update for the trainer to get the best possible experience. That is really the story of smart trainers and the WhisperDrive in particular; the hardware is controlled by the firmware and it is the firmware that determines the experience. In this case JetBlack aren’t quite there. This is their first smart trainer and they are planning to make more. The WhisperDrive is really slow to respond to power changes – around 8 seconds by my clock – but I have no doubt that over the next while, the engineers will reduce that lag to a more reasonable level. The other quirk I found most (but not all) of the time was a power “rebound” after a large power change. For example, I tried doing intervals with 15 seconds at 800W and 4 minutes at 125W. After each drop from 800>125 the power jumped up again, briefly, such that I could barely turn the pedals. Minor (and I would call them minor) firmware glitches aside, the WhisperDrive is a good trainer. As the only unit I tested that does not require plugging into mains power, one could use the WhisperDrive to warm up for a race with full control of the power regardless of the location of said race. That feature alone is almost enough for me. The WhisperDrive is not quite “whisper” quiet, but it is no more than average level noisy and it didn’t whine. The legs fold easily, locking in the use position but not in the carry position. That coupled with the absence of a handle means carrying this little trainer (it is the smallest of the bunch) is a bit difficult. Not too bad, but the awkward shape with one heavy end means it is never going to be the most carry-friendly object (at least partially countering its utility as a portable warm-up machine). There is a red power light that comes on after just a couple of pedal strokes. It is worth mentioning that the trainer has an impressive reserve of power and remains connected for at least several minutes after pedalling ceases. It calculates cadence from the power spikes which means it works really well but can be fooled by high speed, low power situations where the spikes are not very clear. Like most of the brands represented here, CycleOps has been in the trainer business for a long time. The Hammer is their first model in the smart trainer genre. They clearly did their homework as it was a favourite around my house during the review period. The housing feels as solid (and heavy) as a big hammer. The legs (which lock in both use and carry position – and hold the front wheel tray when closed) provide a very stable base from which to do intense training; it is never going to tip over in a sprint. The front wheel tray looks like the sort of tray used with a wheel-on trainer, only it is so thin its use is unnecessary – it does stabilise the front wheel though (and it carries a disc brake spacer which is handy for training without damaging the rear disc brake when the wheel is removed). The Hammer has one LED that indicates power and connection status by changing colour. It is on the quiet side and the noise is not objectionable. There is a large handle built into the case, which simplifies lugging the dead weight around. For whatever reason, the Hammer carries “heavy”. Like the Flux, the Hammer goes to sleep too quickly but I found it would reconnect to my computer once I started pedalling again (unlike the Flux). The Hammer does not measure cadence, necessitating an additional purchase to get these data. The example I reviewed had been well used before I got it – the case was marked all over and many of the stickers were damaged. It worked absolutely perfectly however. The Hammer really feels like it should last forever. TechnoGym stands out in my mind for two traits: they produce pro gym equipment and they sponsored a top road cycling team some 20 years ago. One would hope that this means they understand the needs of the training cyclist—and so it seems to be after spending some time on the TechnoGym. If I was going to select a trainer to put permanently in my living room, this one would be it. It is a thing of beauty. The design and the finish are a clear cut above anything else I tested, but so is the price. The TechnoGym is fully BLE compliant and can sync with both the MyCycling app on iOS and android and with Zwift. Using it with Zwift accurately requires running the MyCycling app simultaneously. However as lovely as it is to look at, it definitely has some idiosyncrasies that prevent it from being clearly the best trainer in the same way it is clearly the most expensive trainer. While they advertise it as ANT+ connected, it is not ANT-FEC ready, so I wasn't able to run erg sessions from my Garmin. The TechnoGym app offers a whole suite of training, coaching and corrective services and advice, but we didn’t have time to explore any of the trainers' apps. Many of them are extensive and elaborate with loads of training functions and it would take more pages than we have available to cover them all. I did however enjoy my time on the TechnoGym in Zwift. While it's not overly loud I found the noise of the TechnoGym a little whiny and unpleasant at higher cadences. The TechnoGym has an optical eye on the centre foot to measure cadence – potentially a more reliable sensor than the methods employed by other trainers. The legs are geared to each other meaning they scissor in and out together and lock in place. Carrying the trainer is quite easy thanks to its lighter (than most) weight and the centred handle on top. For storage or transport the TechnoGym comes in a foam suitcase – which while it roughly quadruples the volume of the trainer, also protects home and trainer from bumps, and the handle on the case is quite comfortable on the hand. Overall this trainer works well, has an impressive suite of training features in its digital app, and it gives good access to Zwift. It is a thing of beauty and with some small enhancements it will become quite exceptional. I remember being very sceptical when I heard about virtual cycling. If I am going to ride, I want to actually ride! And if I am going to train, then I want to use erg mode (see Box One). That was until I tried it. I found it to be terribly addictive! Similar to a computer game, Zwift presents a nicely detailed scene for you to ride around in (there are currently 3 locations: London 2012 Olympics’ course, Richmond 2015 UCI World’s course and Watopia – a volcanic island replete with underwater tunnels made of glass and roads through the centre of the volcano). The physics “engine” looks at the rider parameters (weight in particular, but it allows you to change equipment too) and based on your W/kg output, determines a velocity that you should be travelling at. At its most basic you can free ride around the environment using your smart phone and the accompanying app to wave hi to fellow riders, hook a U-turn or otherwise deviate from your pre-chosen course and even to select “power-ups” for short-lived higher performance. 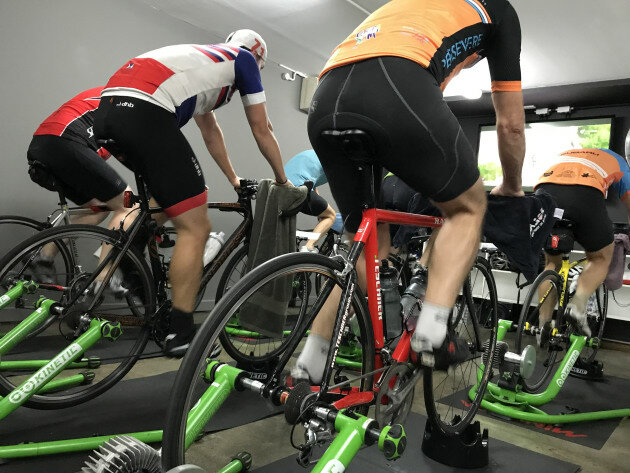 Zwift also offers a variety of programmed workouts, including multiple week prep programs aimed at specific events like the time trial. Or you can program your own. There are group rides, which like your local club ride can be as mellow or competitive as the riders choose to make it. Racing is also an option. Categories are based on W/kg levels to make it fair. I think there is a race starting about every 20 minutes, 24/7. You can draft other riders, you can hear the birds and if you have a Tacx Neo you can even feel and hear the texture of the road you are on (I love the buzz of a wooden plank bridge as you ride over it because it so realistic). The realism level is high, and it gets better with each update of the software. At any given time there are around 1500-5000 people Zwifting. Hills have KOMs (and with loads of pros on Zwift at this time of the year you will have to be very good to snag even a daily KOM). I am amazed at just how much is going on in this virtual world. The final cool feature I want to mention is visual customisation. Every kilometre ridden nets you 20 experience points. Every thousand experience points unlocks one piece of new equipment in your quiver. Some clubs (like mine!) have custom jerseys in the environment – but even if yours doesn’t, there are many jerseys to choose from. So far I have received deep carbon rims, shallow alloy rims, a multi-colour sock pack and a second carbon bike to choose from. Facial and head hair, helmet use, sunglasses, gloves, sock height and frame colour are just some of the options. 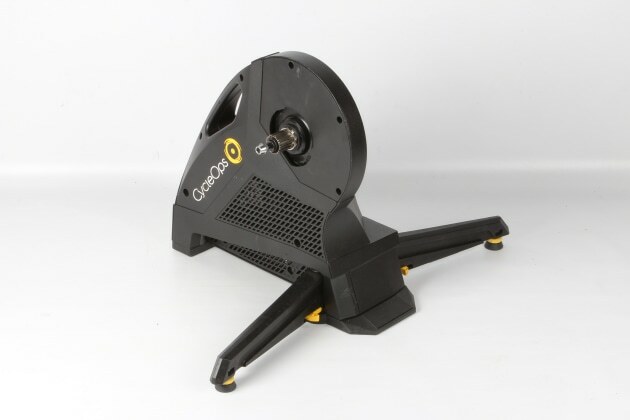 Having once ruined three tyres in one particularly bad week of winter training I will begin by recommending anyone who wants to do a lot of virtual/indoor/erg-mode cycling get a direct-drive style unit. For casual use, the wheel-on units are far more convenient and cheaper. While I particularly liked the Hammer, the Kickr and the Direto; my frenzied month of Zwifting and erg-mode use involved swapping daily across the test units and I generally had to look to see which one I was on. You really can’t go too wrong. Each unit has its quirks and its specific power limitations (which are mostly high enough to never be an issue for an average cyclist) – just make sure the quirks you buy will work for you. There is no one best trainer. One of my favourite, if not the favourite, drills I use as a coach is the Tabata Protocol. I won’t detail it here, but in short it is an interval with the “on” portion done at 170% of a rider’s VO2MAX. It is relatively easy to determine what Wattage that should be, but it was only with erg mode that I could be sure someone was achieving the target power. 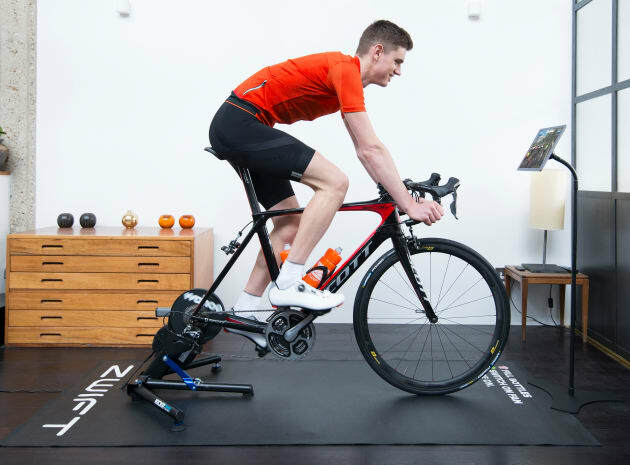 Using an ANT-FEC head unit (such as a Garmin 520 or Wahoo Elemnt) the entire workout can be described in a few simple steps and then ridden on a smart trainer. The trainer locks onto the set power regardless of gear and cadence. It makes the protocol even harder but also more effective and more controlled. I usually see better progress when it is done on a smart trainer than when it isn’t. The other way to use erg mode with an ANT-FEC head unit is to virtually ride a course. For example, one could ride one lap of an upcoming race circuit or a particularly difficult hill that you want to get better at. Now that the route information is in the head unit, that data can be used to control the trainer’s resistance; the steeper the hill, the higher the resistance. Then from home you could re-ride that course as many times as necessary to master it. 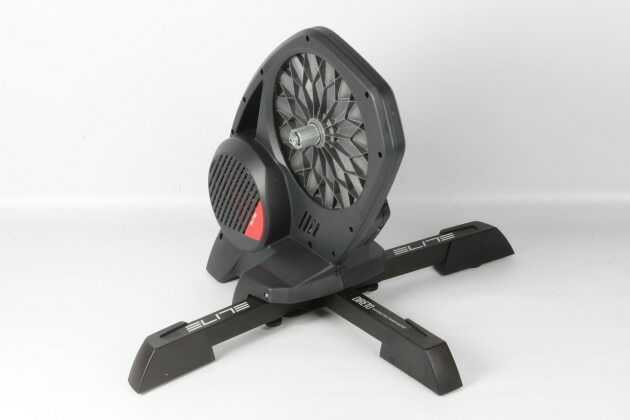 Have Your Say - We are keen to hear your thoughts on indoor trainers - give your feedback below.